What is the Efficiency Gap? Gerrymandering is when political district boundaries are drawn to benefit one group over another, thus creating an imbalance in the value of votes cast for each side. 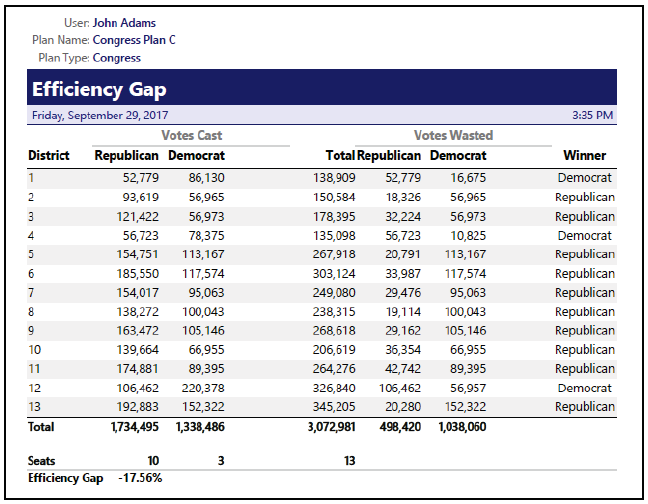 The Efficiency Gap is a way of quantifying this effect by counting the number of wasted votes for each party and identifying large imbalances towards either side. The Efficiency Gap is a measure of partisan symmetry, introduced by Stephanopoulos and McGhee1. They proposed this measure, which is a single percentage for district plan, as a practical legal test for Political Gerrymandering cases. Given election results for a set of districts, usually statewide, the wasted votes for each party in each district are computed. All the votes for a losing candidate are wasted. Any votes in excess of those required to win are wasted. E.g., with 100 district voters, 51 are required to win. In the case of ties, which cannot happen in practice, all votes in that district are wasted. The overall wasted votes are tallied planwide for each party. The Efficiency Gap is the difference in wasted votes as a percentage of the overall votes cast. Maptitude for Redistricting reports the Efficiency Gap of the first party with respect to the second. The Efficiency Gap would have the opposite sign if the parties were swapped. Maptitude for Redistricting also allows for third party candidates, usually assumed to be from a collection of random minor parties. In such cases, the votes required to win are reduced by the third party votes. It is assumed that no third party is viable and none can win a majority of the districts. Maptitude for Redistricting does not use Stephanopoulos and McGhee's simplified equation: Efficiency Gap = Seat Margin - (2 x Vote Margin), since the number of registered voters varies by district, violating their mathematical assumption. However, their formula is still useful in understanding the properties of the efficiency gap. Maptitude for Redistricting can estimate the Efficiency Gap for a plan based on historical election results. The user needs to estimate the votes received for each party by district. Maptitude will assemble a report detailing the wasted votes for each party and then give a final statistic of the Efficiency Gap as a percentage of overall votes cast.